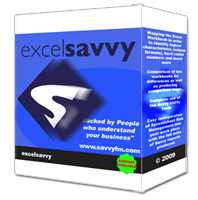 ExcelSavvy is a dynamic spreadsheet professional solution to help uncover Microsoft Excel user error, perform professional spreadsheet auditing and helps the user to understand models more quickly by equipping them with a set of ExcelSavvy Utility tools. The ExcelSavvy interface utilises the latest version of Excel XP to its maximum potential to give the user a seemless computing experience. Excel spreadsheeting is used by millions of users throughout the world. It is a piece of software that allows users of various abilities to explore and solve problems in a structured yet highly flexible computing environment. As users have pushed Excel's functionality and limits, especially with bespoke financial and statistical spreadsheets, potential for error has greatly increased. Spreadsheeting for business decisions, options, accounting calculations, financial statements and much more are all at threat from Excel user errors. The financial implications of such errors can be catastrophic. Newly in 2008 added is ExcelSavvy Lite (see Purchase Page for details). "My client is looking for assurance over their Excel model". "A major investment bank has sent me an Excel model. My company has to check if it is doing what it should. The model is 7MB in size. I haven't a clue where I should even start". "I am looking at a Valuation model for a multi-million dollar transaction. The valuation feels a little high since the client played around with the model. The finance director mentioned the CEO may have typed the numbers into the logic on the Cashflow worksheet." "I originally sent the new analyst our latest portfolio hedge fund excel model for updating. Since this time the model results are now showing errors and the analyst is now on holiday in Chile. No one can get hold of him. The model is so complex and I don't know exactly what he changed." "I have a 'monster' model 70MB in size but I have assured my department that it is easy to maintain as 35 of the 40 total worksheet are logically all the same. Although I am a trusted individual within our organisation, I would like to provide everyone some assurance that this is the case".